We have another story to share with you about how you can do small things to help raptors and other wildlife. 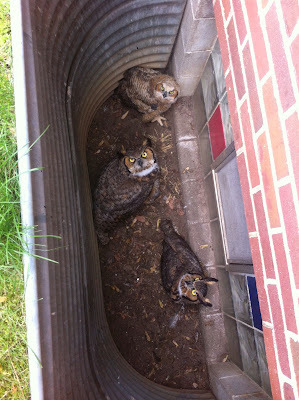 A TRC volunteer was recently called out to assist a recently fledged great horned owl who got stuck in an egressed window well at a house in Minneapolis. When she arrived, not only did she find the youngster stuck in the well, but both of its parents too! Apparently, they flew down to bring the youngster food, but once down, could not fly vertically to get out. The family was trapped. With heavy gloves and protective gear, the volunteer removed all three owls and transported them to TRC’s clinic to be checked out. It was unclear how long they had been in the well and they were all a little dehydrated. After supplying supportive care and re-hydrating them, the entire family was returned to their home site. We thank the homeowners for calling TRC. We also want to remind everyone that covering those window wells with lightweight, clear plastic covers will not only keep snow and rain from your windows, but also ensure that wildlife will not get trapped. Mice and other rodents might be close to homes in these areas, especially in the cooler spring temperatures. Owls are important for rodent-control in our shared ecosystem.